JJ Market Project Manager Apiradee “Oh” Tantivejakul is presented with a donation check for Santisook Cat and Dog Home at the recent Dog Show held at JJ Market, with her are a dog trainer and several people who came to the show with their own dogs. JJ Market regularly holds various events including dog shows, orchid shows and a weekly organic vegetable market. The Thai German International Friendship Organization (Samma Kom Phuenthai German) hosted its first meeting to discuss their annual charity fundraising Gala which takes place the 20th of August 2013 in the Imperial Mae Ping Hotel Chiang Mai.The event this year is very special as the chances are high that Her Royal Highness Princess Soamsawali will patronize the event and also participate personally. 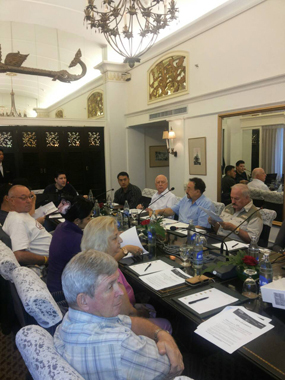 The executive board and artists taking part in the event were very satisfied with the discussions involving almost 20 people held Sunday the 28th of July 2013 in the VIP meeting room of the Imperial Mae Ping Hotel.. Information at 053/038084 (Podology Center Office Chiang Mai) or [email protected]. 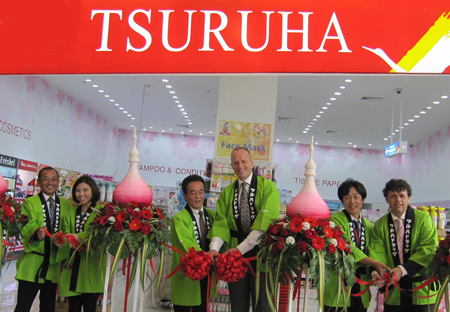 Mr. Akio Takase and Benchamas Tongprasit, Executive Director of Tsuruha (Thailand) cut the ribbon to celebrate the opening of their first new branch of the Tsuruha Super Drugstore of Northern Thailand at Promenada Resort Mall Chiang Mai. 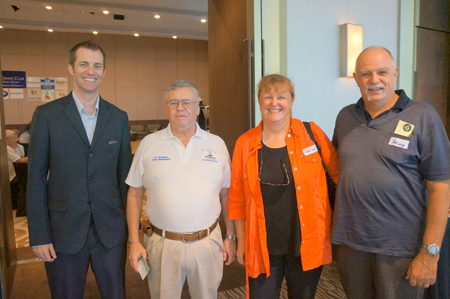 The celebration was attended by Mr. Tjeert Kwant, President and Chief Executive Officer of Promenada Resort Mall Chiang Mai and Mr. Marc Vermeulen, Director Project Development South East Asia, ECC International Real Estate of ECC. 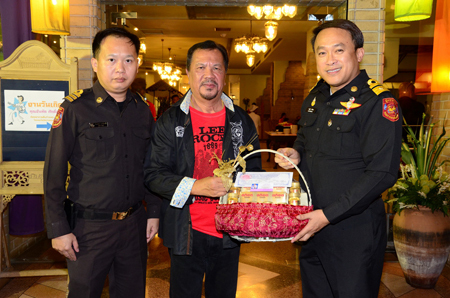 Chanchai Keelapang Chief of Chiang Mai Land Transport Office (right) gives a basket of flowers to congratulate Santat Saksung, Editor of the newspaper The Chiang Mai News (middle) on the occasion of his 65th birthday on July 25,2013 at the Carnival Room at Lotus Pang Suan Kaew Hotel. 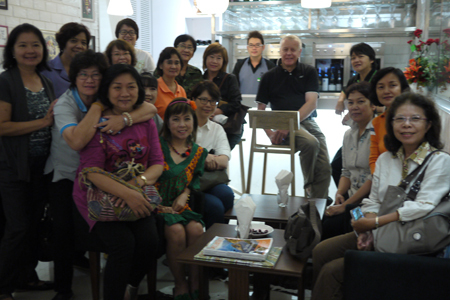 High school friends gathered at the Wine Bar in the Rimping Supermarket at Promenada Resort Mall on July 25, 2013. The Wine Bar is conveniently located next to the wine section and is open from 11am until 2pm and 5pm until 9pm. Wine by the glass starts from 185 baht, wine can be purchased from the wine section of the supermarket with a corkage fee of 200 baht for wine less than 500 baht. Food such as smoked salmon, lamb, ceviche, tenderloin as well as sushi, and Japanese food, pastries and desserts. K. Pim at 0081-5949586 for reservations. Let Chiang Mai Mail help you make it extra special. Our Around Town photographer might be able to come and take a photo. and we’ll be happy to publish them.